My Friends Laughed When I Told Them I Was Going Cliff-Diving at Age 68... But My Wife Knew I Was Serious! “How did you know my mom?” I asked. “Why your mother and I were in the same class at our college” he chuckled. “But that means you are over 90, and you certainly don’t sound that old” I responded. “What do you do to stay so active and energetic?” Mom’s college classmate proceeded to educate me on the importance of exercise, a good diet and the right nutritional supplements. As I hung up the phone it struck me that I didn’t have John’s vitality and I was only 63! My kids are in their 20s and are in no hurry to have their own children. Would I be healthy enough to play with grandchildren at age 70, 75 or 80? Being an active grandpa meant a significant change in my lifestyle. I began by visiting with my doctor and having baseline health and wellness tests done. Then with the advice of my doctor, I began taking Cardiotabs omega-3 supplements and a multivitamin. That was the easy part. To make a significant difference I needed to include an exercise program in my routine. 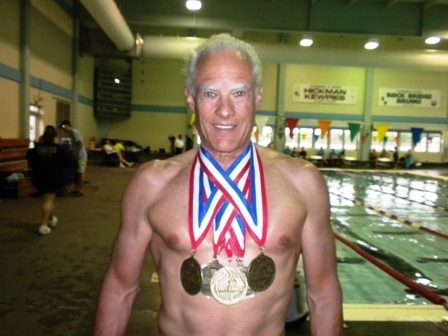 winning the US Men’s 200 Meter Fly for my age group. A few years later, I decided to try cliff diving. Unfortunately, I missed on a 1 1/2 dive and injured my shoulders. However, I am currently recuperating and I love every minute of my new, healthy life. I made a decision to change my life and now I am enjoying the rewards.